It's a tricky one this, plants are always easier to identify when in flower but when they are young it can be much harder, particularly with plants like this as comfrey can be edible and foxglove certainly is not! See what I mean, they look quite similar don't they? But you really can't get these two mixed up, some people eat comfrey leaves (fried in batter) but they do contain an alkaloid that is toxic to the human liver, however you would need to consume quite a lot for it to have such an effect, foxglove on the other hand is quite poisonous, and a few handfuls of these leaves would find you in hospital very quickly indeed. these are foxglove leaves and you can see just how hairy the leaf stems are, in fact they feel almost velvety, the leaves are also slightly serrated around the outside, (enlarge the top pictures to see this). Good luck in your early spring foraging and be careful and sensible with what you pick. Working with Bone again - Making a Bone Knife. Its been quite a while since I've worked with bone and its something I really enjoy, so a few hours spare time recently allowed me to make a few items, one in particular, a bone knife, is something I've wanted to do for a while. I wanted something primitive looking and not too refined, something an ancestor would have made, so it's a bone blade, hawthorn handle and it's fixed with pine pitch and artificial sinew. It's very comfortable in hand and I haven't put a serious edge on it as I've found it looses the edge quickly unless it's used on flesh or soft material, however if it's a serrated edge it works very efficiently and lasts a lot longer. and along side a victorinox farmer for scale. Mora Robust has been DISCONTINUED! It's with a heavy heart that I have to report that the original Mora Craftline High Q Robust that we all know and love has been discontinued by Mora, I received an email from them today confirming that it's no longer in production. It's such a pity as this is a superb knife and I quite like it in the grey colour, I liken it to wood pigeon grey! Anyway all is not lost as the Mora Companion Heavy Duty (essentially the same knife just in a different colour scheme) is still available at the minute. However if you want the original Robust you need to move quickly! Dirt Time, Re-covering the Basics. 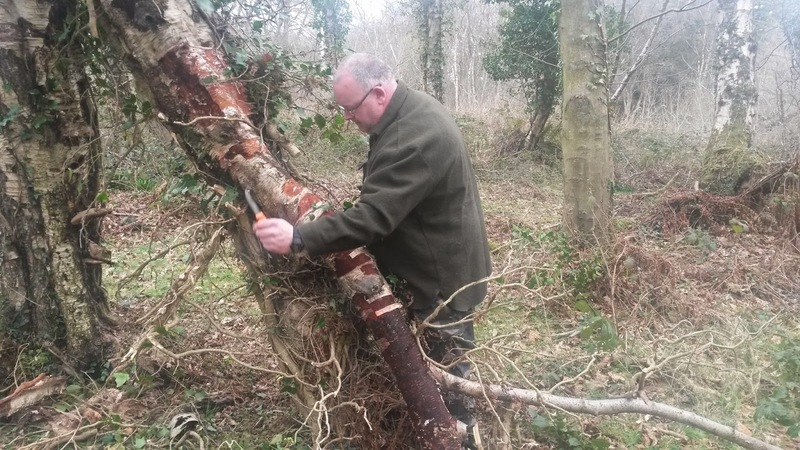 It's all too easy to do something once then forget about it, so I believe it's important to cover ground again to refresh the memory and keep your skills well honed, practice makes perfect after all. So we went out today to cover a few simple techniques and see what else could be done. we found a downed birch so figured we'd make use of it and make some more birch bark oil, we had very little left anyway. didn't take long and we ended up with about 100mls of top grade birch oil. 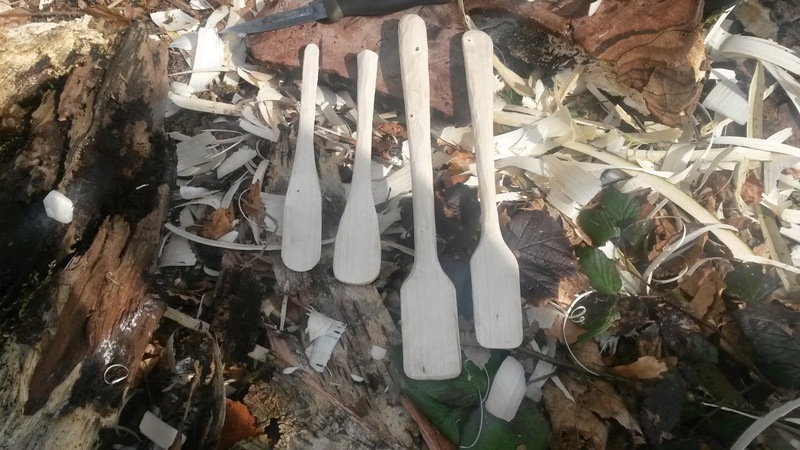 We also honed our knife skills by making spatuloons. A friend once said that I should practice using different knives to make sure I'm comfortable with any cutting tool as I may not always have my beloved 510 with me, sound advice actually, so these were carved with a Mora Robust, 3 are mine one is Davy's, can you work out who's is who's?? 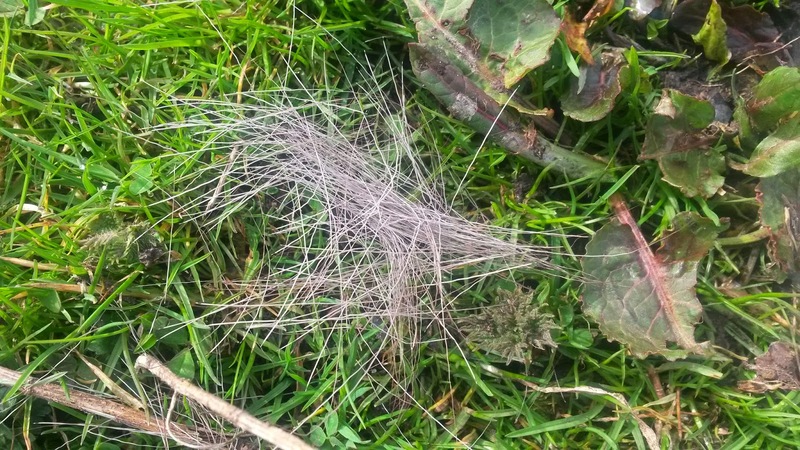 Then we did a little tracking finding, mouse, rat, rabbit and deer tracks, no fox or badger but I'm sure if we had have spent longer we would have found some. 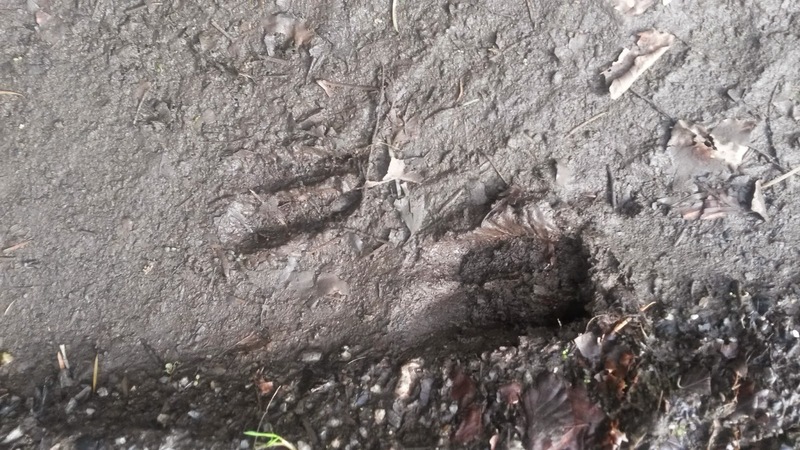 Anyway we followed these deer tracks for a while until we found ..
a large bundle of it's fur..obviously shedding it's winter coat as the weather warms up.. A great day out and we could have done so much more if time allowed. I'm sure some of you have seen this pic before, it was taken by renowned wildlife photographer han bouwmeester .. 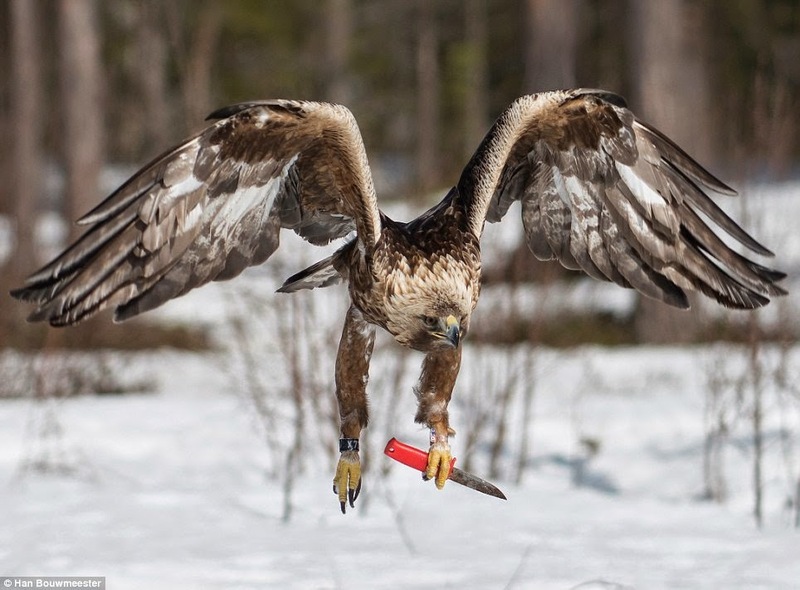 It seems that even our feathered brothers realise a good knife when they see one, why use talons when a mora Viking will do? 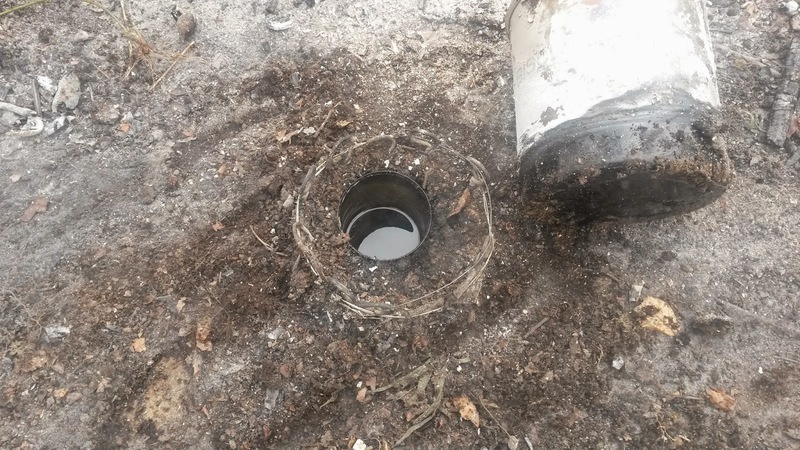 Does a Bushcrafter Dump in the Woods? 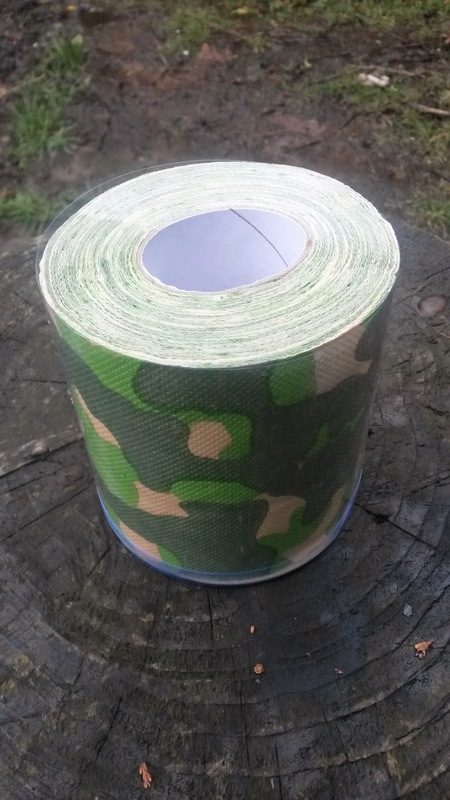 There's a brilliant new product out if you get caught short in the woods, it's partial camo Toilet paper, the reason it's only partial camo is because you add the defining colour to it (if you know what I mean) and that means you don't have to bury the stuff, it blends right in to the background. Get yourself some, it's better than sphagnum moss!